After the last few days of walking in the Fisherfield whilst based at Shenavall, today we opted for a day walk accesible from the road for a change. As we had to drive round to Kinlochewe, we didn't actually set off walking until 10:15am. It was drizzling as we followed the path on the north side of the Kinlochewe River. After just over an hour we crossed the raging torrent of Abhainn an Fhasaigh by a bridge above one of its watefalls. After collecting water from a less ferocius side stream, we ascended up towards the bealach to the west of Meall Each. By now it had stopped raining and it was quite warm on the ascent. 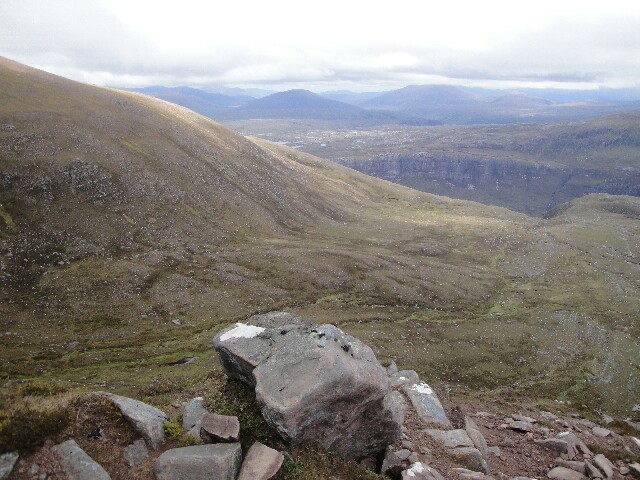 Upon reaching the bealach, we stopped for lunch before continuing up the coire. The ascent up to the false summit was quite steep and we entered the cloud at around 850m. 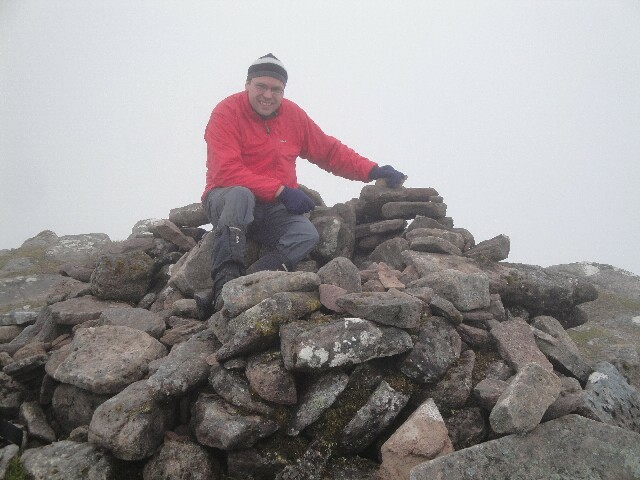 We continued up to the trig point and then on to the true summit of Slioch (Munro), which we reached shortly before 3pm. 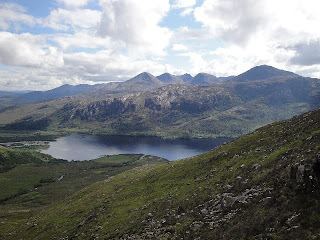 Whilst we were on the summit, the cloud briefly cleared for less than a minute to reveal a good view down to Loch Maree, before we were again surrounded by cloud, which was a shame as the views from here are said to be excellent. Opting for a circuit of the hill, we descended the east ridge and soon dropped mostly out of the cloud. Looking along the ridge, it seemed as if it was a dividing line for the cloud as the north side was covered in cloud but everything to the south was free from cloud. We reached the summit of Sgurr an Tuill Bhain (Munro Top) at around 3:30pm. In descent we followed a path through the scree, which soon petered out, before picking a way down to the coire floor. We returned to the bealach to the west of Meall Each; by now the sun had come out and it was turning into a very warm afternoon. 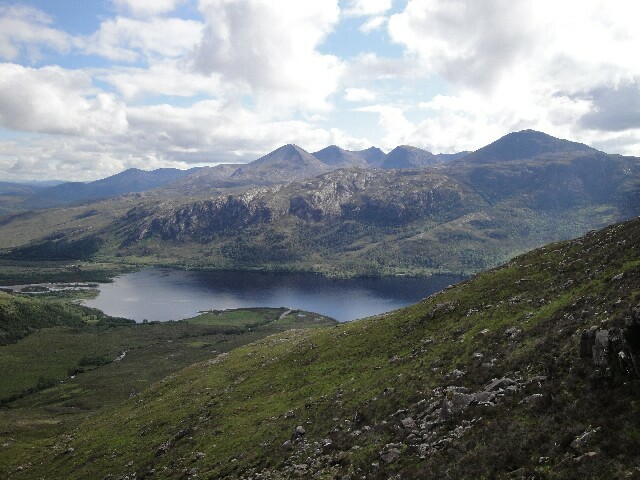 We descended back down from the bealach via our ascent route, with good views over to Beinn Eighe. We got back to the car just after 7pm and headed to the Kinlochewe Hotel. After a long wait whilst they confirmed whether they had sufficient room in their bunkhouse for us, we were able to check in and enjoy an evening of food and beer in the pub.